Mr. Whiskers is a lot of fun to make and encourages kids to recycle some of those empty toilet paper tubes too. Cover a bath tissue tube with pink construction paper. Use marker to draw eyes at one end, or glue on wiggle eyes, if you have them. Draw, color, and cut rabbit ears from pink construction paper. Tape these to the inside of the tube above the eyes. Draw and cut four paw shapes, with attached legs, from pink paper. Glue one pair of paws to the sides of the tube. Tape the legs of the second pair to the inside of the bottom of the tube. Bend the paws at the bottom of the tube to the outside so the rabbit will stand. Cut three strands of straw from a broom or whisk broom for whiskers. Glue the centers of the whiskers to the tube below the eyes. String or yarn may also be used for whiskers. Cut two small rectangular shaped teeth from white paper. Glue these just below the whiskers. Glue two white pom poms or small balls of cotton over the whiskers at the top of the teeth. Glue the remaining white pom pom to the back of the tube for the tail. Glue the small pink pom pom over the white ones on the face for a nose. You can also use a small piece of pink crumpled tissue for the nose. 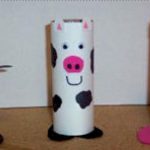 This kids craft project was created by Marie from West Dundee, IL and is reprinted courtesy of ThriftyFun.com. Our goal at ThriftyFun.com is to provide valuable information to help people save money, save time and solve problems. ThriftyFun and its predecessors have been online since 1997. ThriftyFun has grown from modest beginnings to become a vibrant online community. Today, ThriftyFun.com is an interactive Web site where you can post questions and contribute answers to others who are trying to have fun while saving money.